Would anyone happen to have GM part numbers for the rear coils on a 73 SS? Were the F-41 suspension springs different? I don't see any mention of F-41 on the moog website. As far as I know the F41 option was sway bars. 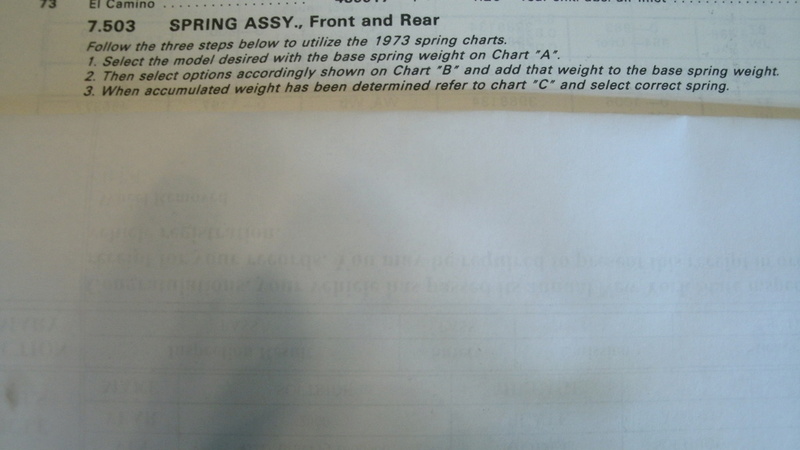 Even on my 70, the front sway bar was 1.25" instead of the standard 1" and it came with a rear sway bar where standard did not. The springs were the same. in 70 however, the F41 included boxed lower arms and a triangulated brace to support the front of the lower bar mount. I'll take a look when I get a chance . 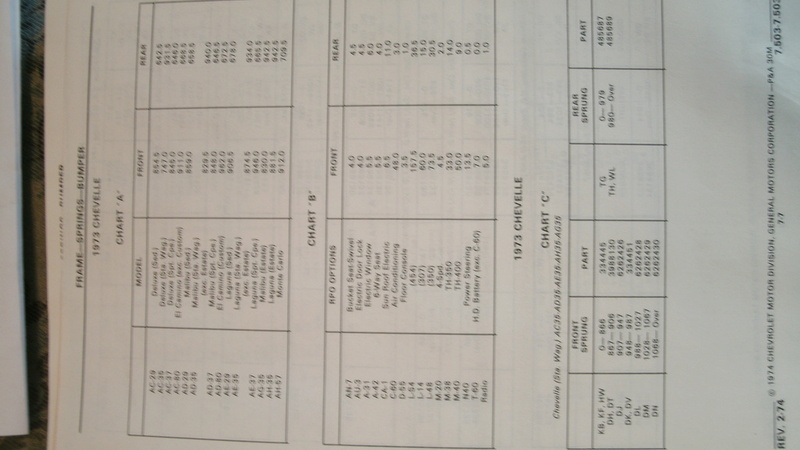 I have a 1973-74 original Chevy parts manual. But honestly, I'd either order standard all around or heavy duty all around. All in Moog. Thank you for the replies. The springs that came with the car spec out to be A-body wagon springs. based on wire diameter and free height. They spec out perfectly to a Moog 6381, which is a wagon spring. I'm wondering if someone swapped them out or if they are original to the car and are part of the F-41 package. the car sits about an inch higher in the back with these springs. GM literature always mentioned heavy duty springs and shocks as part of the F-41 package. I'm wondering if any of the GM books list a different part number for the F-41. 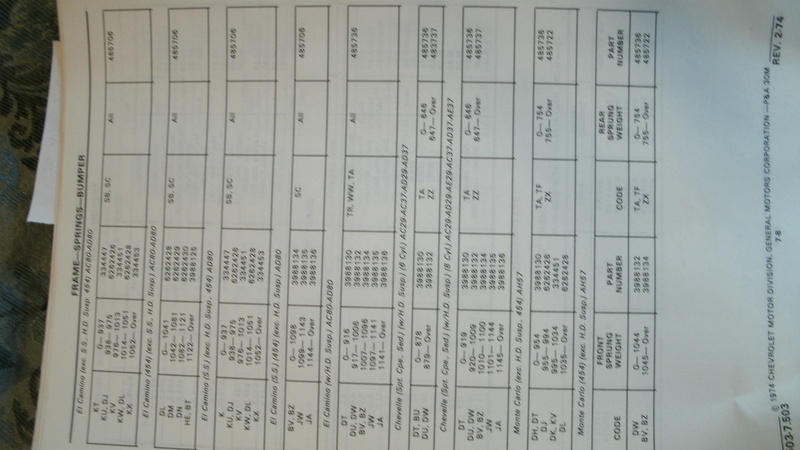 Moog lists a 5391 as being the correct coupe and sedan spring, all engines. Here you go. Just read the instructions on the first pic. Then get the info from the other 3 pages. Those pages list all the combos. 6cyl. 8 cyl. SS, wagon, etc. Looks to me like you have a choice between the Moog 5415 @ 170 lbs/in or the 5391 @ 142 lbs/in. The 5415's are supposed to be at the same load height as the 5391 with 50 lbs more weight per spring. I've had (and still have in the garage) the 5391 springs and they soak up the bumps very nicely. Send me a PM big red if you want to sell them. They are about $100 @ Summit. I'll look these charts over and make a decision. Thanks Joe for taking the time to dig through your books. much appreciated. The 5415 springs are only 65 bucks plus shipping at rock auto. The 5391 are about 80 there. I think I just made up your mind for you. Don't forget to Google RockAuto discount code. There's always a 5 percent coupon code floating around. 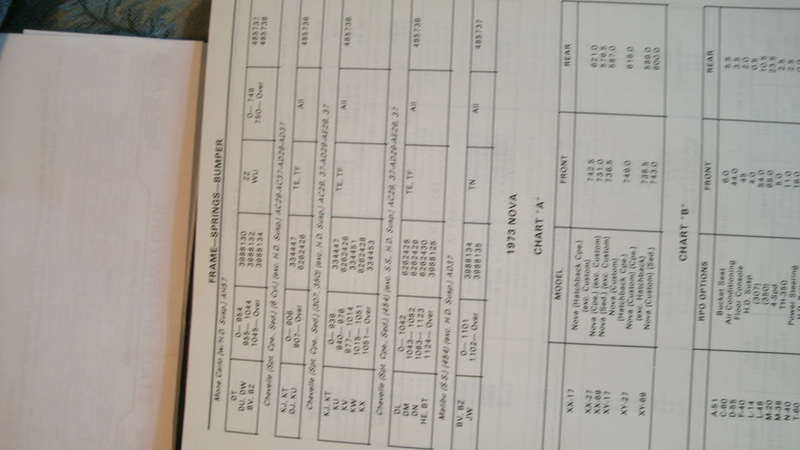 Joe, On the second pic, chart "A", malibu spt coupe, could you confirm the weights? It looks like front is 848, and rear is 645.5? Looks like I'll be going with the 5415 spring. That crosses over to GM 485737. 5391 crosses over to GM 485736. The front is 848 and rear is 646.5. Your 485737 looks to be correct as per the factory manual. Thank you. What are you going with? Always Moog. 73 with 350, no ac, heavy duty. I like the stance with 28" tires. I'm running Moog 5415 and 8002 Springs. Thanks Joe, The 5415's are on the way. Rock Auto sent the 5% last week.